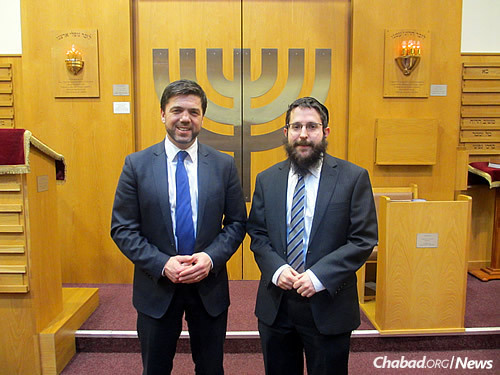 Secretary of State for Wales Stephen Crabb, left, paid a visit to the Cardiff United Synagogue, led by Chabad-Lubavitch emissary Rabbi Michoel Rose. When Jewish people the world over begin putting up sukkahs—the temporary dwellings used during the week-long holiday of Sukkot, which this year begins on the evening of Sunday, Sept. 27—Rabbi Michoel Rose will be adding an additional task to his pre-holiday checklist. He’ll be prepping for a radio appearance for the community at large in Cardiff, the capital of Wales. Located on the western side of Great Britain, Cardiff—a port city on the southern coast where the River Taff meets the Severn Estuary—is home to some 350,000 people. 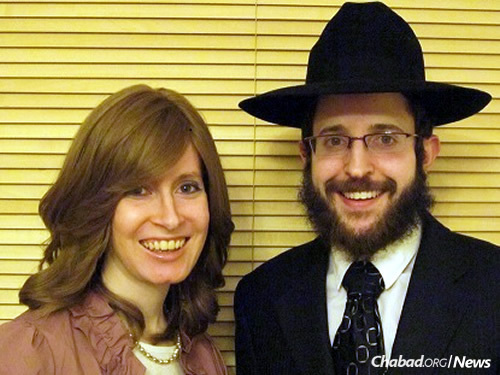 Rabbi Rose and his wife, Esther, are Chabad-Lubavitch emissaries in Cardiff under the auspices of Chabad Lubavitch UK Headquarters. He also serves as religious leader of the Cardiff United Synagogue. As such, he appears on the BBC Wales radio program “Wednesday/Weekend Word” several times each year, discussing issues in the news and lessons related to various Jewish holidays. His radio address this spring before Shavuot, for example, examined justice. An ensuing program before the third day of the Jewish month of Tamuz, the yahrtzeit (anniversary of passing) of the Lubavitcher Rebbe—Rabbi Menachem M. Schneerson, of righteous memory—focused on taking the Rebbe’s message of doing good out into the greater world. 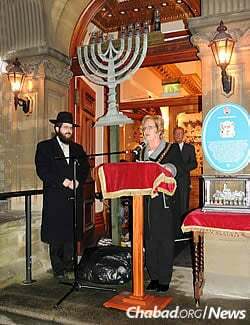 The rabbi with the Lord Mayor of Cardiff Councillor Margaret Jones, addressing those gathered last Chanukah for the city's first public menorah-lighting. And the Roses do go out in the world. “Being representatives of the Orthodox Jewish community in South Wales means we attend civic functions, such as the national Remembrance Day in November, and other high-profile events. We also liaise with other faith leaders about things that may affect the community,” explains the rabbi, who was born and raised in Leeds, England, and then lived in Manchester, England, before moving to Israel for a number of years. Given such media appearances and communal duties, the Jewish community of Cardiff would seem to be quite large. In actuality, it’s rather small. About 800 Jews live in the city, with about 2,000 mostly older Jews across the country in total. According to Esther Rose, who was born to Israeli parents in Tucson, Ariz., and has lived in several cities across the United States, “Cardiff once had a very large [observant] community.” But with a limited Jewish infrastructure—there were no Jewish elementary or high schools—a number of families left Wales. Others moved to pursue opportunities beyond the local borders. In addition to Cardiff, a very small community of some 160 Jews lives in Swansea, about an hour to the northwest. The last remaining synagogue there was sold, and services are now held in a leased space on Friday nights and on Jewish holidays. A Chabad rabbi travels there to lead services for the High Holidays. 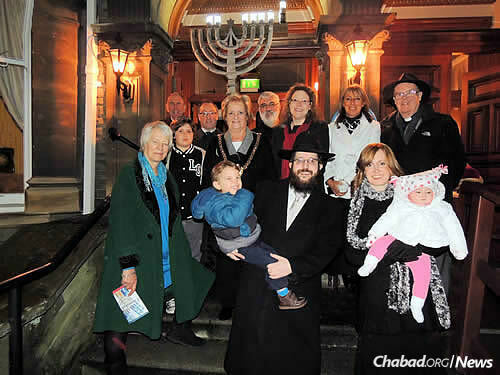 The Roses with Jones, and local parliament members, assembly members and religious leaders at the city's first public Chanukah menorah-lighting on Dec. 21, 2014, in front of the Mansion House, the official residence of the Lord Mayor of Cardiff. 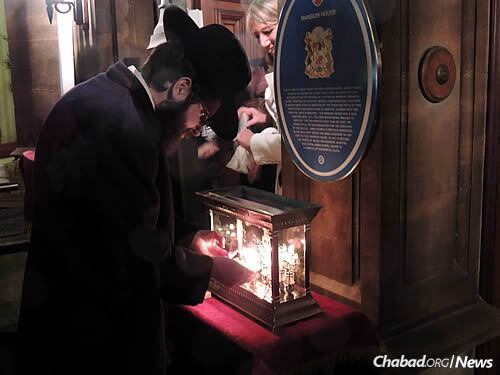 The Jewish community of Wales, which is part of the United Kingdom, traces its history to the mid-19th century, when Jews fleeing persecution came to the country from places like Russia and Eastern Europe. A second wave of Jews came during World War II. The community reportedly once had as many as 5,000 members and lived in several different cities across the countryside, including towns like Newport and Merthyr Tydfil. In these cities, once-grand synagogues have since been sold. But in Cardiff, some of the basic foundations for a thriving Jewish community exist. A minyan is offered daily at the Cardiff United Synagogue, and a functioning mikvah is housed on the synagogue grounds. Kosher food is delivered from London twice a month. 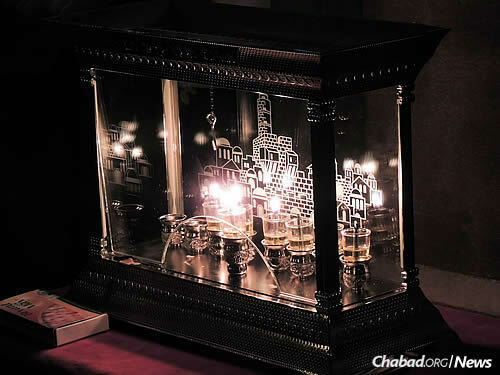 Lighting a menorah inside the Mansion House as well. Yet there are signs of growth. “A handful of families have moved to town, mostly Israelis, and a couple of younger single people, so there is hope for the Jewish future here,” she adds. 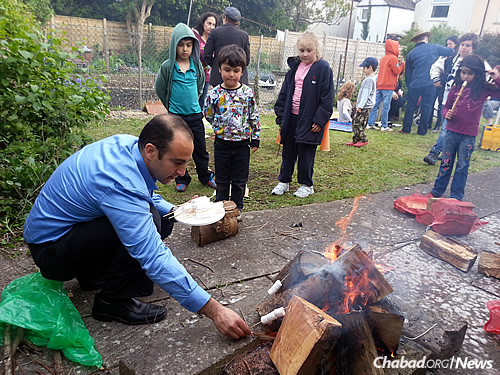 To that end, the community celebrated a bar mitzvah this past spring—“a once-a-year event” in Cardiff—held a Lag BaOmer bonfire, and marked Shavuot with an ice-cream and cheesecake party, followed by a communal meal. That’s in addition to the regular slate of programming that the Chabad couple runs, including a Sunday school. Educational options for adults are also expanding, says Rabbi Rose, noting that the Rohr Jewish Learning Institute’s (JLI) “Journey of the Soul” course begins on Wednesday, Oct. 28. “The Roses are at the heart of the community,” says Ilisa Factor, who has two children in the Hebrew school. “They have a warm, friendly and supportive approach, and are inclusive across the generations. They arrange a variety of events, talks and meals, which appeal to all members across the community. Roasting marshmallows at a Lag BaOmer bonfire this spring. There are signs of growth in Cardiff: A handful of families have moved to town, mostly Israelis, as well as a few younger single people. 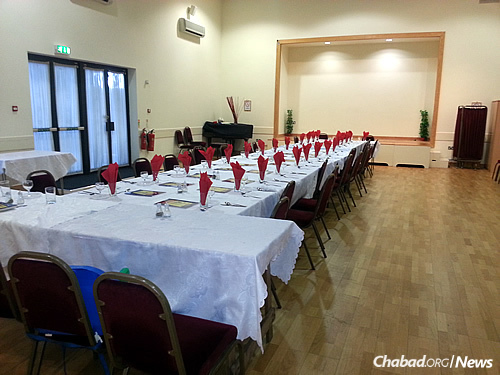 All set up for a Shabbat dinner, held in addition to the regular slate of programming that the Chabad couple runs, including a Sunday school. An adult-education course starts on Wednesday, Oct. 28. Kol hakavod A shana tova umesuka, Reb Michoel!